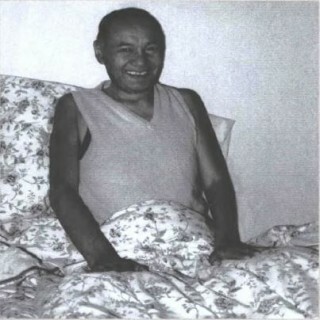 Lama Yeshe a few weeks before he died. Photo by Age Delbanco. Some twenty minutes before dawn on the first day of the Tibetan New Year – March 3, 1984 – the heart of Lama Thubten Yeshe stopped beating. He was forty-nine years old. Lama had been seriously ill for four months, although according to Western medical reports since 1974, it was a miracle that he was alive at all. Two valves in his heart were faulty and because of the enormous amount of extra work it had to do to pump blood, it had enlarged to about twice its normal size. And he himself had said ten years before that he was alive “only through the power of mantra.” By November 1983 it was obvious that his life was in serious danger. Mindful of our root guru unequaled in kindness, king of great bliss, Heruka of the body mandala, crown ornament of the holders of the practice lineage of Ganden, I here pay homage to Trijang Dorje Chang, and in doing so reply to your series of advice, my spiritual brother, Ven. Jampa Wangdu, which you sent with such great affection. I will avoid exaggerations and will write a reply reflecting the nature of illusion-like dependent arising. Due to my right and left channels being filled with the violent movement of thought-winds and overflowing out of control beyond the capacity of which my ordinary heart can cope, and in order to safeguard myself from this, I was forced to place this “difficult to find body of leisure and endowments” in the hands of a strange doctor. Upon examining me for half an hour, he advised that I must definitely go into the intensive-care unit of the hospital. Believing that this was the case, I asked him to protect my life. Never have I known the experiences and sufferings that then followed.